AutismWonderland: If You Won $10,000 What Would You Do? I could pay off my student loans, a few credit cards, take a (much needed) vacation or put it in the bank. But if I won $10,000 I wouldn't do any of those things. I'd use the money to better my community. Last year, my friend and I decided we were going to start a non profit and open up a school for kids with autism in The Bronx. My Dream School. Because as of now, there are no appropriate schools - public, private, approved non-public - in The Bronx for kids like The Boy. And as a result, The Boy is bused to a school 22 miles away from home. When it comes to special needs resources and schools, The Bronx is grossly under serviced. Everything seems to be in Manhattan, Queens or Brooklyn. I shouldn't have to move to make sure my son has the services he needs. Every child has a right a free and appropriate education regardless of their zip code. And when it comes to special education and resources - the appropriate, shouldn't be seen as a privilege. That's why building a Dream School in The Bronx means so much to me. Starting a non profit takes money, time and more money. Money that 2 working moms struggling to make ends meet don't really have. And so our dream of building a school in The Bronx is one that has been deferred (for now). And then Nicole of Presley's Pantry nominated me for Yahoo's Women Who Shine. And the grand prize is $10,000! Obviously I will need much more than $10,000 to build a school but it would be a really good start. In a few days, I'll be celebrating my blog birthday - 2 years old. And when I first started blogging I never really thought that my words would or could make a difference. I was so moved reading why Nicole nominated me and her words really validated why I continue to write and share our story. Lisa has touched my heart time and time again. I read her blog Autism Wonderland as if it's my personal bible. 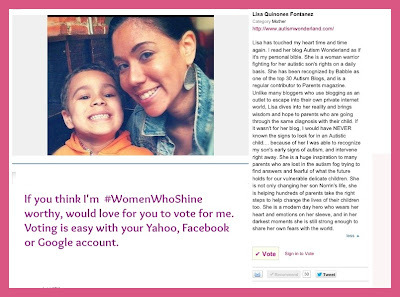 She is a woman warrior fighting for her autistic son's rights on a daily basis. She has been recognized by Babble as one of the top 30 Autism Blogs, and is a regular contributor to Parents magazine. Unlike many bloggers who use blogging as an outlet to escape into their own private internet world, Lisa dives into her reality and brings wisdom and hope to parents who are going through the same diagnosis with their child. If it wasn't for her blog, I would have NEVER known the signs to look for in an Autistic child.... because of her I was able to recognize my son's early signs of autism, and intervene right away. She is a huge inspiration to many parents who are lost in the autism fog trying to find answers and fearful of what the future holds for our vulnerable delicate children. She is not only changing her son Norrin's life, she is helping hundreds of parents take the right steps to help change the lives of their children too. She is a modern day hero who wears her heart and emotions on her sleeve, and in her darkest moments she is still strong enough to share her own fears with the world. If you would like to help me win so that I can build my Dream School, you can vote for me by clicking HERE. If you've voted already - THANK YOU! If you're off to vote - THANK YOU! Would love for you to share with your friends and family. Whether or not I win the grand prize - a Dream School in The Bronx will be built. It will not be a dream deferred for too long. And if you'd like to read about why I starting blogging and how it's changed my life, feel free to click HERE.